With all the talk out there of comic book films, we can’t help but hear the call for one about the awesome female heroes that populate the Marvel Universe. In the past month alone I’ve read articles about Ms. Marvel (both the Carol Danvers version and the African-American version from the 80s), Black Widow, and Jessica Jones… the main character in the promised third Marvel Netflix series Alias. What I haven’t heard is the one that should have had a stand alone film or television series years ago just based on its relevancy to the times. The comic book title in question? 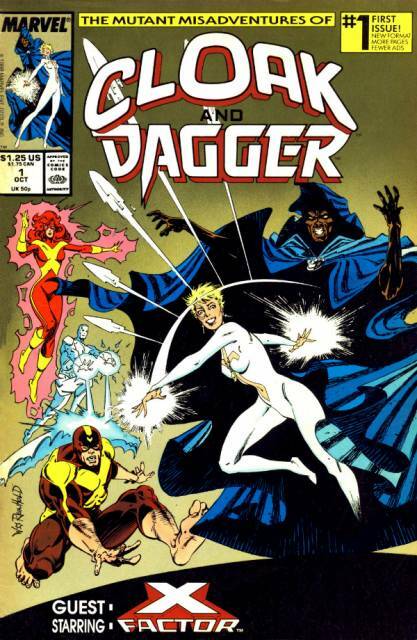 Cloak and Dagger… and for those of you not familiar with the title or its characters, I am happy to share. In March of 1982, Spectacular Spider-Man #64 introduced a pair of teenage vigilantes with fantastic powers of light and dark in the characters of the African-American walking shadow Cloak and the angelic, blonde, light weapon wielding waif Dagger. Though not the first time teens were made into superhero archetypes, this was one of the first times that the teens in question were runaways who had lived on the streets and it spoke to the times in which they were created. Another sign of the times was that they had gained their powers through designer drugs. I know… it sounds like a complete mess, but allow me to explain. Tyrone Johnson and Tandy Bowen were both running away from their lives and personal tragedies (Tyrone’s failure to warn his friend from being killed due to a stutter, and Tandy’s neglectful and abusive mother) when they were found by the Marvel Universe’s version of organized crime, The Maggia. The Maggia had designed a new highly addictive drug, and were testing it on runaways and the homeless with poor results… you see, everyone kept dying. As happens to the protagonists in comics, instead of dying, Tandy and Tyrone were transformed and granted strange powers. Tyrone became a portal to the realm of darkness and used fabric to cover himself while he absorbed the souls of his captors. Tandy, on the other hand, became filled with light and began throwing dagger-like bursts at her captors overwhelming their nervous systems. They would go on to escape and take up the cause of the abused and deserted, all while fighting a war on drug dealers and the men who would poison the streets. When they were created, cocaine and heroin were rampant and thirty years later the characters and their quest is still poignant… but I’m a little off topic from where I started, aren’t I? So, what do they have to do with a film about awesome female heroes? Absolutely everything actually. Though the concept is a duo/ team, very early on in the story it’s made clear that Tandy is the stronger of the two both emotionally and in maturity. Tyrone is almost crippled by his stutter, and Tandy draws him out in a maternal/sisterly way right from the start. She’s the strong one when they are in captivity, and she is the one who calms him when they are transformed. From the beginning, Tandy tries to give to Tyrone the patience and attention she believes he needs no matter what it may cost her later. Even more importantly, though Cloak can steal the strength and life from his foes with the darkness he controls and is controlled by, it is Dagger who can restore life and bring light to the darkness much like the Ghost Rider’s penance stare. Her “light daggers” turn the darkness her foes have within against themselves, as if she were forcing them see the evil they’ve done. Additionally, the darkness within Cloak has a hunger for the light of the living and only Dagger has the power to feed it and stave it off. Cloak and Dagger has its roots on the street, and so it is a gritty and darker story filled with the harsh realities of drugs, abuse, and neglect but there is also a story of strength embedded within. Cloak and Dagger share a bond almost untouched by any other characters, sharing not only a symbiotic relationship but a shared purpose and origin. Of course, things aren’t always peaches and cream and over the course of the years, their relationship has been one of the most naturally written one in comic history. They have been friends, partners, lovers, and yes… barely tolerant of each other as any couple who has been together for what seems like forever, still they always find their way back to each other. More than anything else, it seems to me that Cloak and Daggers time has come when people talk about what should be next for the MCU. Its overall themes are as relevant today as they were when they were created, and when looking for a strong female lead people often over look Tandy for the more powerful and bigger named heroes like Natasha, Carol, and Jennifer ‘She Hulk’ Walters. We don’t often look to the teenagers that make up the next generation as the people to lead us into the future, and that’s just what Cloak and Dagger… Tyrone and Tandy… are- teenagers. That being said they deserve the time to shine. Chloe Grace Moretz who played another strong teen comic vigilante, Hit Girl, has the calm and poise to really take on the role of Tandy/Dagger and the physicality to really make it shine. I can only hope that Hollywood and the MCU expands its gaze to give the lesser known amazing female heroes a chance to shine even while they hesitate to take the steps on the bigger names. I mean come on… they gave a talking raccoon a movie, is a strong woman too much to ask for?